Zelda (Zelly) is one of our finest producers and has given us an exceptional type over the years. A fiery fighter of a girl, Zelda is always at the center of any protest action on the farm. She is true to her father’s temperament and will not back down for anyone, or anything. She has much courage and spirit and this is something she passes to her progeny. Zelda has incredible movement and produces progeny larger than what she is. 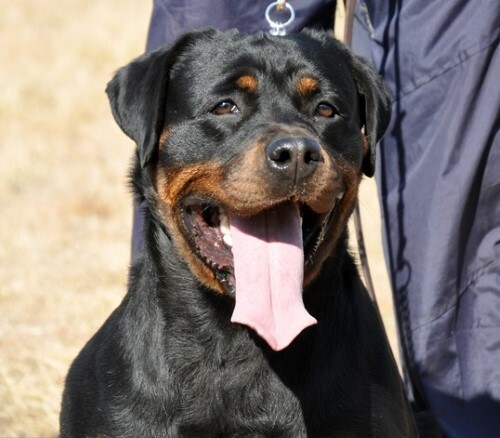 Zelda is also the Craffenheim “record holder” with her litter of 15 pups sired by Onyx vom Weissen Schwan. She showed her incredible mothering skills by raising this litter of 15 pups like a star. As Zelda’s breeding years close at Craffenheim, she will always be a foundation girl who has contributed more than we could ever have wished. Our Zelda will always be a super star and true queen.